CEO, CRISP invites vendors/auctioneers for submitting their financial bid for purchase of two old office Vehicles, two Generator Sets (Diesel) and one Transformer. The offered price shall have to be more than the Reserved Price. Interested parties are requested to quote their rates in separate sealed envelopes for each vehicle/Generator Set and Transformer accompanied with prescribed earnest money in the form of Demand Draft(s) payable to CRISP Society, Bhopal to reach this office on 20th July, 2018 by 4:00 p.m. 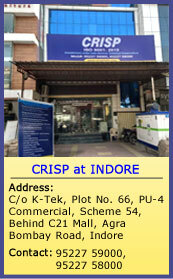 The bids forms, terms and conditions and other details of the proposed sale can be downloaded from CRISP website: www.crispindia.com. C.E.O., CRISP reserves the right to accept any one price bid and reject any or all the price bids without giving any reason thereof.